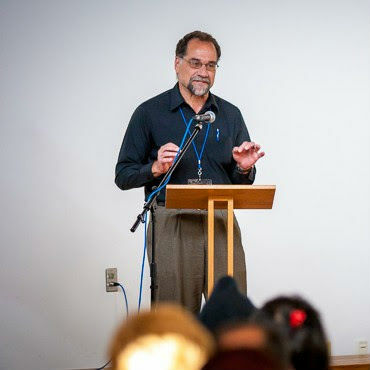 In 1982, soon after he’d finished his undergraduate degree, David Brubaker and his wife Mert moved to Recife, Brazil, for a voluntary service term with Mennonite Central Committee. As assistant country director, Brubaker found himself “learning on the fly” how to manage people, programs and money – skills as pertinent to peacebuilding and development work as they are in the business world. The experience propelled Brubaker to formalize that “on-the-fly” leadership training with an MBA and a PhD. He eventually joined the faculty of Eastern Mennonite University’s Center for Justice and Peacebuilding (CJP) in 2004 with a specialty in organizational development. Next summer, he’ll take what feels like a natural next step in that trajectory when he becomes director of EMU’s MBA program, where he’s taught a course in organizational behavior for each of the past nine years. In recent years, the MBA program has been developing a defined identity around its long-held emphasis on business leadership that looks beyond profits to measure success. Leaman said the writings of University of Manitoba professor Bruno Dyck (an undergrad at EMU for one year in the early 1980s) have been particularly influential to the program’s developing philosophy that places values like stewardship and justice at the core of profitable, sustainable businesses. Over that same period, CJP and the MBA program have been collaborating more closely in response to interest from CJP students who, as Brubaker once did, want to improve their leadership skills. “Peacebuilders are increasingly asking for more education in organizational leadership, as well as entrepreneurial skills to help sustain their work,” said graduate dean Jim Smucker. With the MBA program simultaneously developing a niche around a more holistic understanding of business, Smucker anticipates that Brubaker’s move from CJP will strengthen the growing bond between the departments. Leaman, who also became chair of the undergraduate business department at the beginning of this academic year, will continue in that position after Brubaker becomes MBA director. In his new role, Brubaker will work closely with Sue Cockley, who directs the newer MA in Organizational Leadership program, now in its second year. More than 40 students are enrolled in the two programs this fall. As he wraps up 12 years of teaching at CJP, Brubaker will co-host, with colleague Roxann Allen Kioko, a three-day conference in spring 2016 at EMU on “Leading into the Common Good: An Anabaptist Perspective.” The event convenes 24 speakers, including organizational expert Peter Block, for sessions on innovation, shared vision, resilient organizations, leadership ethics and other topics. A specialist in the resolution of church conflict and the facilitation of congregational change, Brubaker is a member of Cooperative By Design, aconsortium of peacebuilding practitioners with EMU ties that focuses on helping churches through change. He is also on the roster of the Congregational Consulting Group, which emerged from the reorganization of The Alban Institute. Brubaker will remain involved with both after the transition to his new job. He had been contemplating moving on from CJP when the opportunity to direct the MBA program arose, and recognized it as new outlet for his own professional interests. Given the converging directions of the two programs, the idea simply “made sense,” Brubaker said.